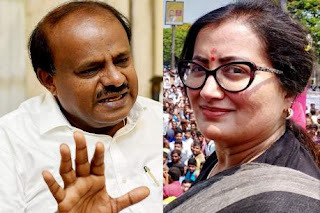 Lok Sabha elections 2019: Chief Minister HD Kumaraswamy's son, Nikhil Kumaraswamy of the JDS and Sumalatha Ambareesh, wife of late superstar Ambareesh, will fight it out in Karnataka's Mandya.Mandya in Karnataka is turning out to be one of the most heated contests in the second phase of polling to be held on April 18. On one side, there is the candidate for the Congress-Janata Dal Secular coalition, Nikhil Kumaraswamy. He is the son of Chief Minister HD Kumaraswamy and the grandson of former prime minister HD Deve Gowda, making this a prestige seat for the JDS.Taking him on is Sumalatha Ambareesh, wife of late superstar Ambareesh. She is officially supported by the BJP. And unofficially by several Congress leaders and party workers who were upset that the Congress allowed the JDS to contest the seat. There are chances that she will win the big fight.